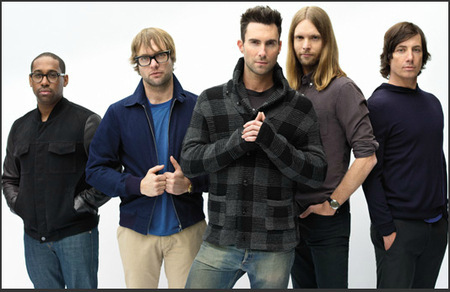 Maroon 5 provided much of the inspiration for “Time Difference”, particularly with songs like “Makes Me Wonder”. Their sound is a fusion of pop-rock and funk, made instantly recognizable by Adam Levine’s distinctive high-pitched vocals. The original members of Maroon 5 had met in college and been playing together since the mid-90s, but it took until 2000 for the band proper to form, and 2002 for the release of its first album, “Songs about Jane”. It took another two years of relentless touring and promotion, and the 2004 release of their second single “This Love” for Maroon 5 to finally break through and find mainstream success. The next single, “She Will be Loved” repeated the success of its predecessor and the album eventually went multi-platinum in the US and many countries around the world… but it took a good 2-3 years of hard work to get there. With every song that I write and record, I like to try things I have never done before. as a singer: to push myself into a higher register in the style of Adam Levine or the Bee Gees. The song started with a lyric from Joel Rockman. I thought the concept and title were very good: on the one hand, quite original, on the other hand quite fitting for the jet-set pop-star life (touring around the world, away from lover) or anyone who’s been in a long-distance/transcontinental relationship, or simply travelling long-distance and missing their partner back home. The music is based on a simple guitar riff that repeats throughout (in yellow on the ProTools session below), answered by a bass riff (in dark blue). Ben Treeby came in to do the guitar parts – I pretty much knew exactly what I wanted, and he got it right away. I did all the other parts, vocals and mixing. The chorus is lifted by a second, funky guitar (green) and simple keyboard chords (purple). A third guitar (light blue) plays power chords over the bridge and final chorus. So this is very much a guitar-bass-drums track, with some added percussions to get a nice groove. Sort of half-way between rock and funk. The bridge is the more “sentimental” section lyrically and I have tried to make it the more melodic and “sweet” section musically, with added synthesizer pad (in turquoise) to soften it up. My favorite part is the break at 1’44” – with just drums, percussions and bass, then the funky guitar and vocal ad-libs come in to build it back up into the final set of choruses. I also like the (hopefully!) unexpected but satisfying chord changes in the second half of the second and final choruses. I had some fun with the vocals, double-tracked in the verse and six-tracked in the choruses. So I can spend my life with you.